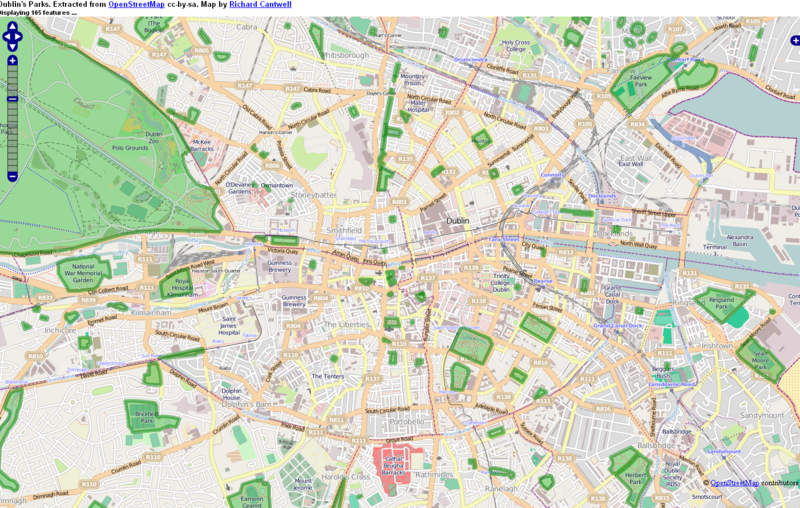 A local, Richard Cantwell from Geograpic.ie (Twitter), has come up with a map which features green spaces that currently exist within our local area, plus the surrounding areas of the city. The very informative map highlights the lack of parks for residents of this area of Dublin’s inner city. Dublin 8 is crying out for a park, with campaigns ongoing to turn derelict sites on both Chamber Street/Cork Street, and Bridgefoot Street, into open grassland areas which locals and visitors to the area can enjoy. Apparently the South East inner city has 14 times as much green space for their kids, as we do here in the South West inner city. Both areas have a similar population. To put it simply, the kids from Dublin 8 have very little safe areas where they can play. And this just feeds into the feeling that this corner of the city has been left out in the rain. We have large amounts of derelict sites and buildings, possibly the highest percentage of wasted space in the inner city, and we also suffer from abnormally high unemployment rates too. But we are fighting back, and many local groups are attempting to get a decent green area for all to enjoy. Please make sure you support the ongoing campaigns to get a proper park for the children of Dublin 8, so that we can improve the living conditions for all Dublin 8 residents as a whole. The only park for the liberties where children would play without hindrance was Oscar Square rosary. But now, upper middle class, new comers have used it for their dogs. The proposed park on cork street is still a mountain of dirt and the people of Bridgefoot have been ignored for their request for a park. I guess money talks in this city. there was an online piece done on Oscar square and it gave publicity for it being a much needed park for dogs. Ive always suspected it was spread over the internet as people flocked to it with dogs within days of it been opened up. evelyn ockenden, Ive complained about this to the council on many occasions. It has improved slightly, but many people still see it as a dog park. I wish it was used more by children too. Sorry Joe I thought i was forwarding your message to twitter. You know were it says website, when you write a message on this website. I sent you a message on twitter a few day ago. I whole heartily could not agree more. While strolling into the rosary park this evening, I had the displeasure of listening to seven dogs barking, mainly three of them, for my short stay. Surely one would think such noise is a breach of the noise pollution act.